*For additional information regarding the criterion for inclusion or membership for lawyer associations, awards, & certifications click image for link. 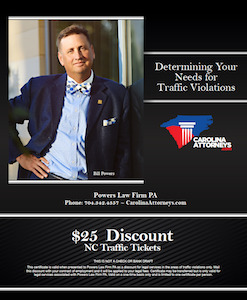 By: Bill Powers, Charlotte Criminal Defense Attorney and author of the popular North Carolina DWI Quick Reference Guide. 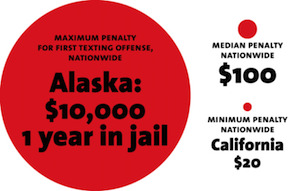 About half of all states now have passed state texting and driving laws that mandate hands-free cell phone usage. 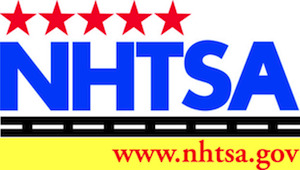 NHTSA, a federal government agency in Washington, DC, tracks car accident statistics in America, to determine their causes. N.H.T.S.A. was the federal agency that pushed for DUI-DWI laws with a national standard of a 0.08 BAC limit for adult drivers, and (a decade or so earlier) in changing the legal drinking age to age 21 and over. To deter the dangerous behavior, the highway safety agency advocates for tougher laws, to match the felony or misdemeanor statutes in place around the United States. The North Carolina legislature has not been able to enact hands-free phones being mandated in NC, despite trying to do so since the original NC text message law took effect in 2007. **There are important exceptions though. See the information provided below regarding texting laws in North Carolina. With the advent of the cell phone and its technological lineage, the smartphone, crashes involving distracted driving while texting now exceed NC DWI accidents. The National Highway Traffic Safety Administration (NHTSA) oversees national driving safety laws, and texting while driving has come to the top of their list of driving offenses, due to the economic impact and loss of lives. NC drivers continue to send text messages while driving, despite constant reminders of the risks. The consequences of texting and driving have received much publicity through public service announcements and advertising media of all types. Traveling at just 60 mph, a vehicle will travel 88 feet per second, or the length of a football field in less than 4 seconds. Some national studies have shown that over one-third of all young drivers text and drive, and cannot perceive that their need to send a text is a problem. This is why media professionals create highly emotional products to bring the message to these young drivers, before they become the focus of a felony homicide by vehicle accident. Trying to talk on the phone while driving or take your eyes off the road in order to see the screen on a smartphone leads to horrific, tragic consequences of texting and driving. But, according to the World Health Organization, even a hands-free Bluetooth phone is dangerous. Additionally, as covered in the WBTV news report, the current, relatively minor North Carolina misdemeanor statute generally pertains to school bus drivers transporting children, and to teen drivers under age 18. Both applicable statutes are set forth below, showing the minor infraction and misdemeanor punishments imposed under NC texting laws. If you want more information about mobile phone laws in North Carolina, we provide a free, confidential consultation. That’s true whether you are cited or charged with such an offense, or have been hurt in a wreck due to someone’s negligence. We handle both types of cases. Additional technology.–Any technology that provides access to digital media including, but not limited to, a camera, music, the Internet, or games. The term does not include electronic mail or text messaging. Mobile telephone.–A device used by subscribers and other users of wireless telephone service to access the service. The term includes: (i) a device with which a user engages in a call using at least one hand, and (ii) a device that has an internal feature or function, or that is equipped with an attachment or addition, whether or not permanently part of the mobile telephone, by which a user engages in a call without the use of either hand, whether or not the use of either hand is necessary to activate, deactivate, or initiate a function of such telephone. Wireless telephone service.–A service that is a two-way real-time voice telecommunications service that is interconnected to a public switched telephone network and is provided by a commercial mobile radio service, as such term is defined by 47 C.F.R. § 20.3. Offense.–Except as otherwise provided in this section, no person under the age of 18 years shall operate a motor vehicle on a public street or highway or public vehicular area while using a mobile telephone or any additional technology associated with a mobile telephone while the vehicle is in motion. This prohibition shall not apply to the use of a mobile telephone or additional technology in a stationary vehicle. Seizure.–The provisions of this section shall not be construed as authorizing the seizure or forfeiture of a mobile telephone, unless otherwise provided by law. Any of the following regarding an emergency situation: an emergency response operator; a hospital, physician’s office, or health clinic; a public or privately owned ambulance company or service; a fire department; or a law enforcement agency. The motor vehicle operator’s parent, legal guardian or spouse. Penalty.–Any person violating this section shall have committed an infraction and shall pay a fine of twenty-five dollars ($25.00). This offense is an offense for which a defendant may waive the right to a hearing or trial and admit responsibility for the infraction pursuant to G.S. 7A-148. No drivers license points, insurance surcharge, or court costs shall be assessed as a result of a violation of this section. [Note: G.S. 7A-148 means that the infraction can be presented on a traffic ticket]. Additional technology.–As defined in G.S. 20-137.3(a)(1). Emergency situation.–Circumstances such as medical concerns, unsafe road conditions, matters of public safety, or mechanical problems that create a risk of harm for the operator or passengers of a school bus. Mobile telephone.–As defined in G.S. 20-137.3(a)(2). School bus.–As defined in G.S. 20-4.01(27) d4. The term also includes any school activity bus as defined in G.S. 20-4.01(27)d3. and any vehicle transporting public, private, or parochial school students for compensation. Offense.–Except as otherwise provided in this section, no person shall operate a school bus on a public street or highway or public vehicular area while using a mobile telephone or any additional technology associated with a mobile telephone while the school bus is in motion. This prohibition shall not apply to the use of a mobile telephone or additional technology associated with a mobile telephone in a stationary school bus. Seizure.–The provisions of this section shall not be construed as authorizing the seizure or forfeiture of a mobile telephone or additional technology, unless otherwise provided by law. Exceptions.–The provisions of subsection (b) of this section shall not apply to the use of a mobile telephone or additional technology associated with a mobile telephone for the sole purpose of communicating in an emergency situation. Local Ordinances.–No local government may pass any ordinance regulating the use of mobile telephones or additional technology associated with a mobile telephone by operators of school buses. Penalty.–A violation of this section shall be a Class 2 misdemeanor and shall be punishable by a fine of not less than one hundred dollars ($100.00). No drivers license points or insurance surcharge shall be assessed as a result of a violation of this section. Failure to comply with the provisions of this section shall not constitute negligence per se or contributory negligence by the operator in any action for the recovery of damages arising out of the operation, ownership, or maintenance of a school bus. If you have questions, we have answers for you at Powers Law Firm PA. We’re here to help. Don’t wait to protect your rights. Call our criminal defense lawyers NOW to obtain answers to your questions. 704-342-4357. We offer confidential consultations and provide free advice and opinions about what we think is the best way to handle a case. There are fees for legal representation. Reckless Driving in North Carolina: What is Reckless Driving NC? Why Hire a Traffic Ticket Attorney? I am so fortunate to have had Bill Powers on my case. Upon our first meeting, Bill insisted that through the emotions of anger, sadness, confusion, and betrayal that I remain resilient. He was available to answer questions with researched, logical, truthful answers throughout our two year stretch together. I went to any lengths for my case because he won my trust almost immediately... J.R.
Bill Powers’ staff has handled several traffic citations for me over the years, and they exceeded my expectations each and every time. Would highly recommend anyone faced with a traffic citation or court case contact his office and they will handle it from there. M.C. Bill and his staff are flat out great. I (unfortunately) was a repeat customer after a string of tickets. These guys not only took care of the initial ticket for me, but went the extra mile and reduced my problems from 3 to just 1 (very minor one) on the same day I called back! I would recommend them to anyone. A.R.